The feeding starts when a diver sinks down to the sandy landing and rattles a PVC pipe filled with bits of metal. It clanks and clatters enough so that it's audible all around the tank. That's the queue for Retread and Carolina to head down to their feeding station. Retread is blind (both our loggerhead turtles are rescues that would not be able to survive in the wild), so the audible queue lets her know it's time to eat. Sometimes the divers have to guide her into position to be fed. 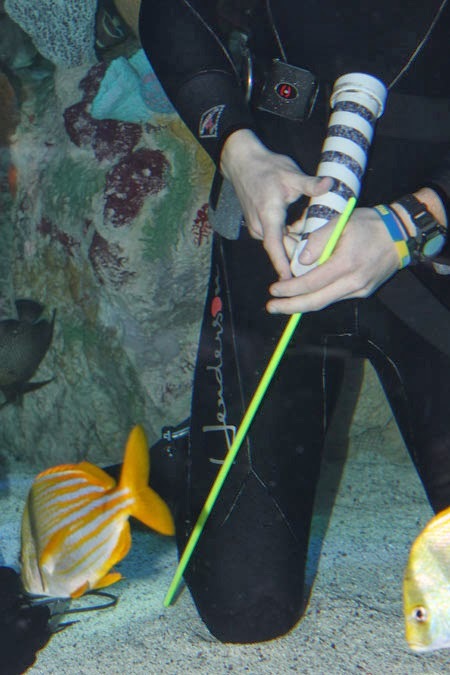 Besides the shaker, the divers also carry a yellow feeding stick. The fish is thread onto the stick and each turtle is offered a bite. Chomp!—the diver pulls stick out of the turtle's mouth just before their jaws close on a tasty morsel. 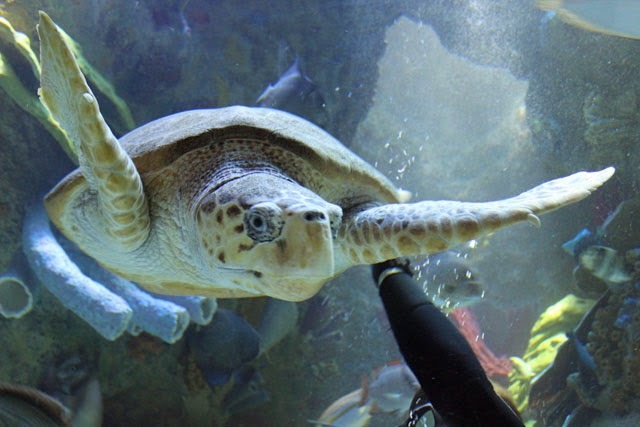 Because the loggerhead's jaws are so powerful, the stick ensure the diver's fingers won't get nipped by accident. Each turtle can put down several fish in a single feeding! Sean's hand is safely out of reach of that powerful beak! The feeding also tends to draw a crowd inside the tank, too. You'll see plenty of porkfish, angelfish and other smaller fish grubbing for scraps that the turtles miss. 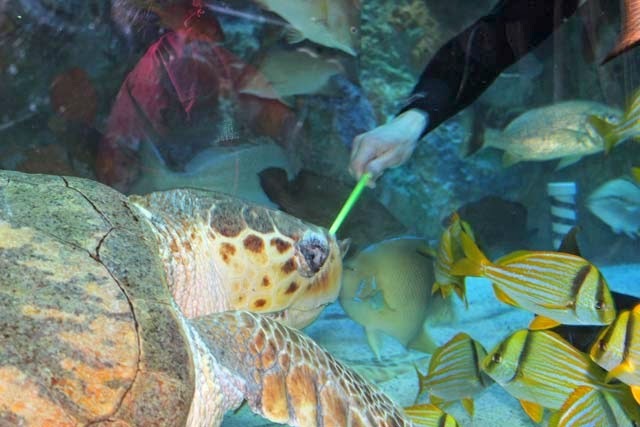 The loggerhead feeding draws a crowd—both outside the tank and inside! 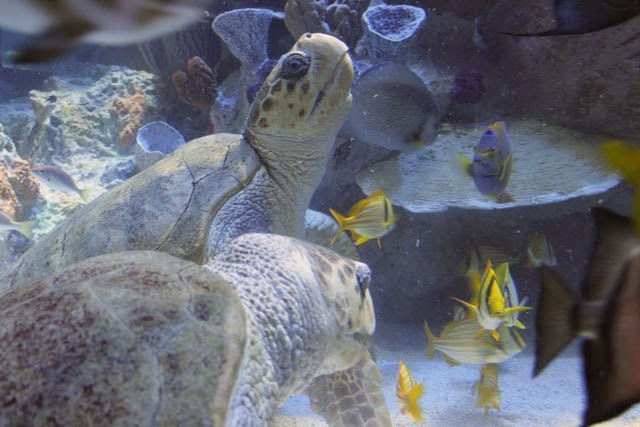 Loggerheads eat mostly seafood, as opposed to green sea turtles that eat a considerable amount of plant matter. 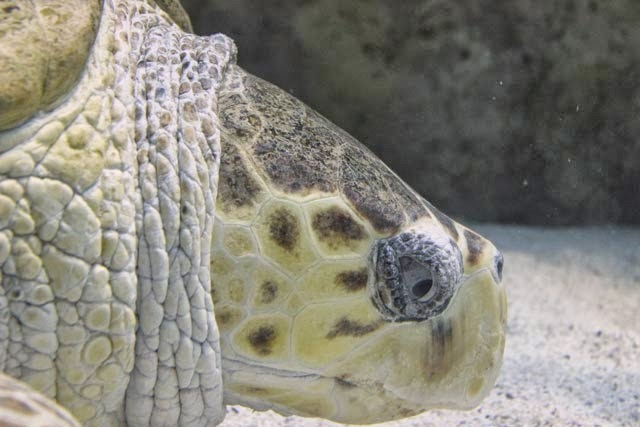 Loggerhead sea turtles are currently endangered. In fact, all sea turtles in the wild face considerable threats including accidental bycatch in fishing gear, boat activities such as dredging the ocean floor and human intrusion on their nesting beaches. But you can help! Make a difference by choosing ocean-friendly seafood options that aren't caught in ways that threaten loggerhead sea turtles. After a tasty meal, the turtles might settle in for a nap—and that's a blog post for another day! 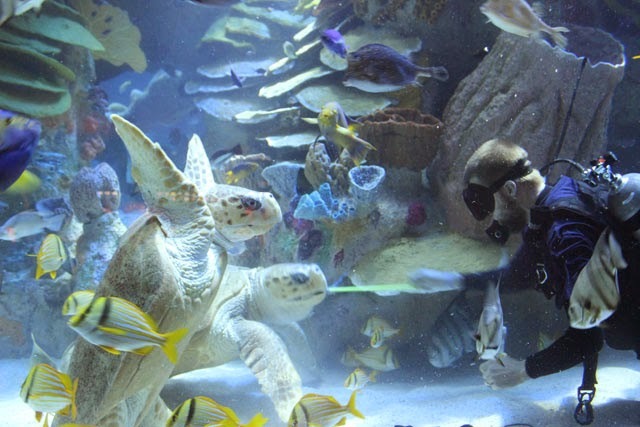 In the meantime, come visit the turtles in the Giant Ocean Tank.